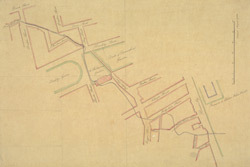 [A plan of the sewer from Bruton Street to Piccadilly with alterations]. bl.uk > Online Gallery Home	> Online exhibitions	> Crace Collection of Maps of London	> [A plan of the sewer from Bruton Street to Piccadilly with alterations]. This tracing of the King's Scholar's Sewer in Mayfair is based on a survey carried out by the Commissioners of Sewers. The plan features a scale bar down the right side of the sheet, with boundaries of private properties outlined in red. Open spaces are shown in green and watercourses in blue.